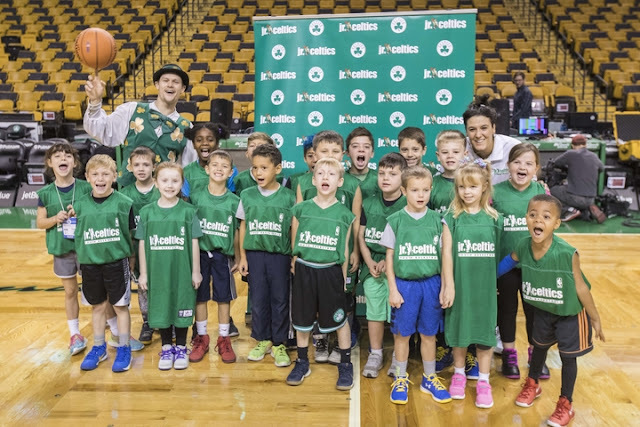 Disclosure: I received complimentary Jr. Celtics admission to facilitate this review; photo releases were signed by participants pictured and all opinions expressed are my own. Love and basketball. That's always been an underlying theme of my family - Mr. Lovebird and I met in college, and while he doesn't believe I played basketball in middle school and high school, he played all the way through to college and then professionally abroad. Nia knows this is a part of her family history, and while we've gently tried to suggest basketball to her she's always been quite reluctant. 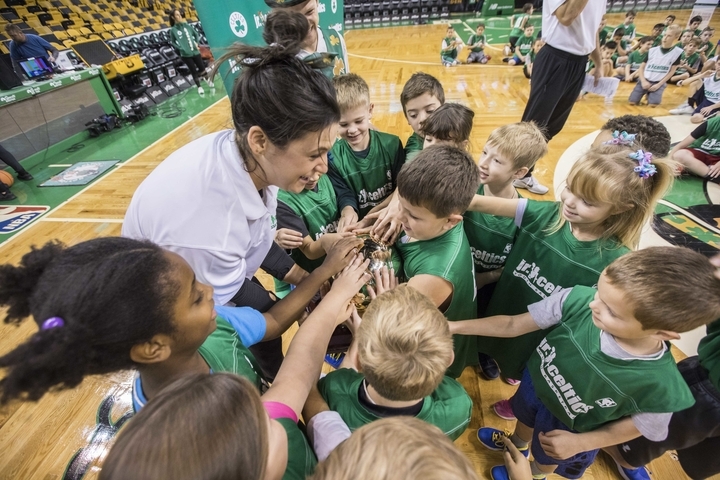 That changed when she was invited to the Jr. Celtics Gameday Clinic. Pretending to shoot before the clinic starts! 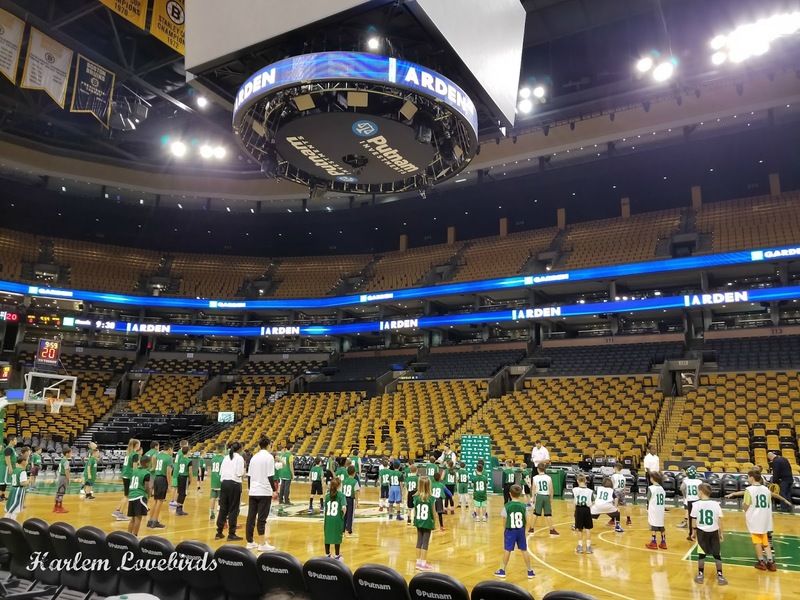 We woke up early Sunday morning to head to TD Garden and while we were both a bit groggy, when we emerged from the parking garage and heard the excited chatter of the other kids waiting to start we couldn't help but perk up. 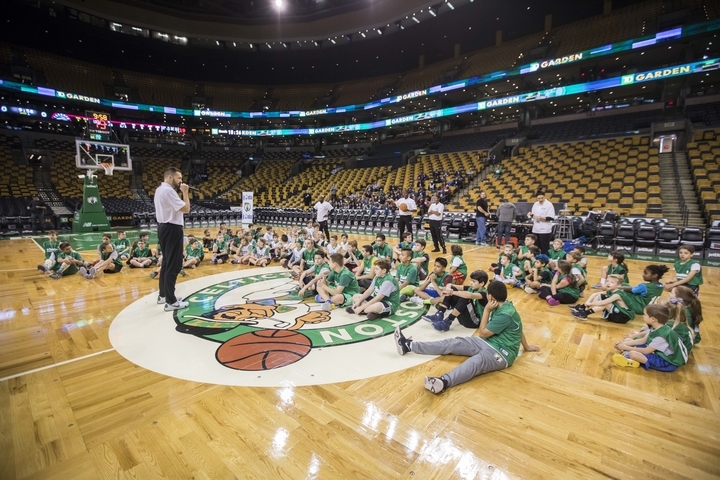 The Jr. Celtics program offers clinics at both the TD Garden and the practice facility that allow kids ages 5-14 years old to work on their basketball skills with local coaches. 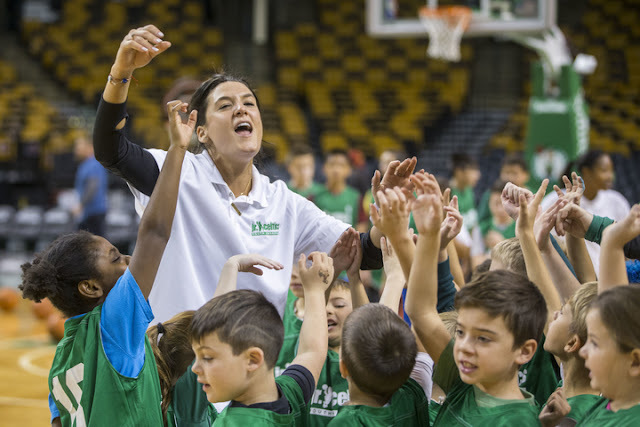 Kids were put in teams by age so when we showed up Nia when right to her Coach Sophie who led the Green Team. Each of the four teams received jerseys (they got to keep them!) 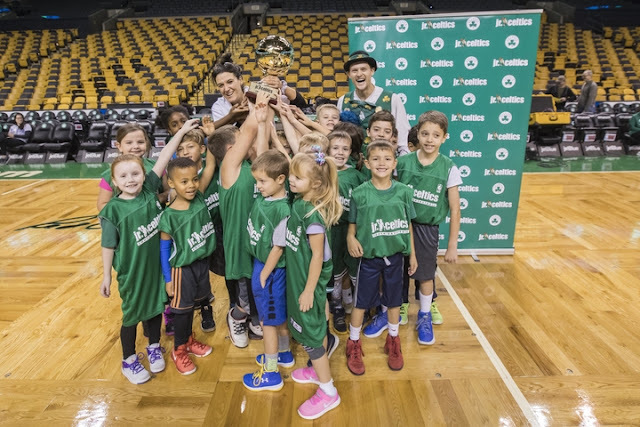 and the day was set up with a bit of friendly competition with a spirit trophy prize to be awarded at the end of the clinic. Of course Lucky was on hand (remember when we first met him?) and did a few flips for the kids. The parents on the sidelines couldn't help but cheer! After the kids were put through a warm-up we watched the kids go through their 4 stations. 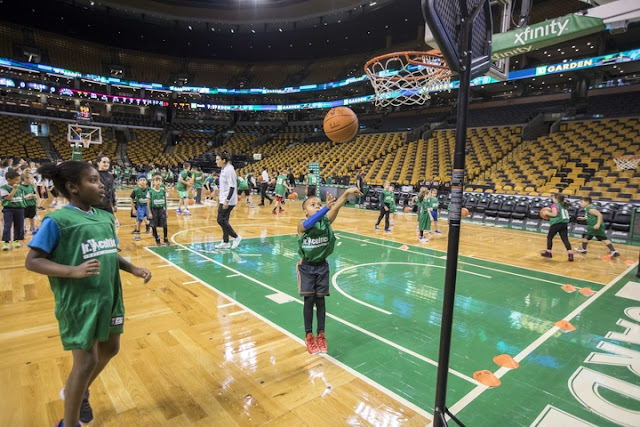 From shooting, passing and defensive drills it was perfectly targeted to the age groups' ability. I was thrilled to see a few girls of different skill levels participating too! 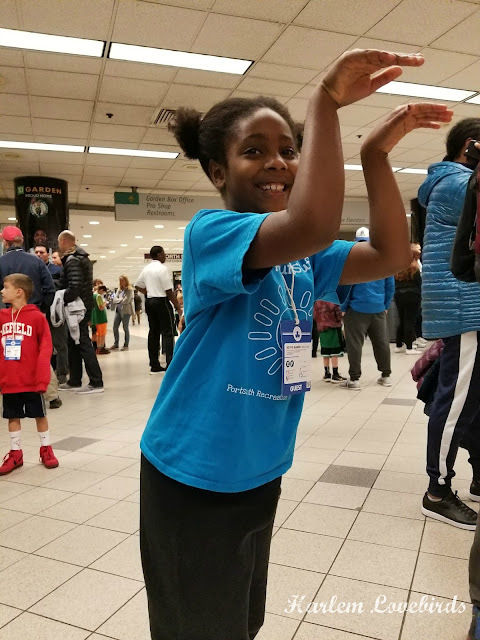 When she arrived home she excitedly shared her day with her dad and asked if they could go out to shoot hoops together. Mr. Lovebird smiled so big! Would you like to give your kids the Jr. Celtics experience too? This is the inaugural season of the Jr. Celtics program with over 20 sessions to sign up for including Rookies Skills and Elite Skills Clinics as well as the Gameday Clinic that Nia attended. Featuring on-court training by select coaches and special guest VIP experiences now's the perfect time to sign up (did you hear the Celtics have won 14 straight as of this post?!) - just head over to the website to sign up:www.jrceltics.eventbrite.com. When the Clinic is over you'll receive access to a digital album of professional pictures too - it really is a wonderful memory-making day and would make a great gift this holiday season! Do your kids show interest in the sports you played as a kid?